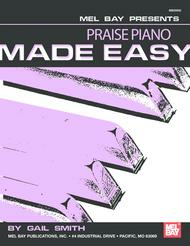 Praise Piano Made Easy composed by Gail Smith. For Keyboard (Piano). Made Easy. Sacred. Beginning-Intermediate. E-book. 32 pages. Published by Mel Bay Publications - Digital Sheet Music (M0.20952EB).ISBN 1609746104. Sacred.Each arrangement in this exciting collection has easy left-hand rhythm patterns that compliment the Praise song. Fifteen popular songs are included in this book which may be used as a piano solo or as the song is sung in church. Selections include: "Glorify Thy Name", " My Life is in you, Lord" , "Jesus, Name Above all Names", and "Celebrate Jesus". The arrangements sound harder than they are and are a great addition to every church pianist's repertoire as well as intermediate piano students.About Digital Print Sheet MusicDigital Print is printable sheet music available anytime, anywhere. Just purchase, print and play! View your online sheet music at home, school, work or anywhere you have a computer connected to the Internet. Use our iPad app to view your digital sheet music on the go. With Digital Print, you can print your digital sheet music immediately after purchase, or wait until its convenient. And our software installation is easy - we'll guide you through the simple steps to make sure you have Adobe Flash Player, Adobe AIR and the Sheet Music Plus AIR application.